Vibrant is a word that applies to Melbourne, Australia -- the vibe on the clean streets is one of happening energy. Multiple movies have been filmed in Melbourne, art abounds, some nightlife has a highbrow-coffeehouse slant, and the hip wear black (think about it). You've got to stop by Melbourne if you're in Australia -- check out some Melbourne street photos to get the picture. 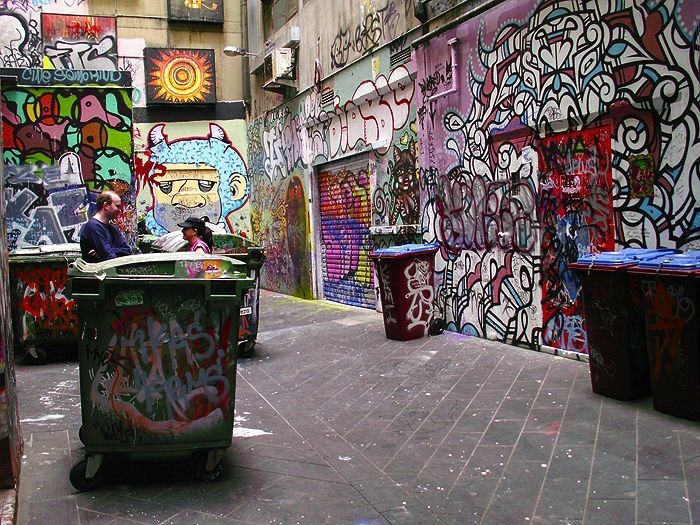 Melbourne encourages graffiti to a degree, thus there is great art graffiti to be seen in streets, like this graffiti alley in Melbourne. Click for full size and full color art graffiti photo. p][h3]How to Say Coffee in Australian[/h3] Of great interest to me in Oz was how one orders coffee down under. Australians, like any coffee lovers, have their own bean lingo, and a term to learn if you're ordering espresso in Asutralia: flat white. Like a latte, but less milk; foam is folded in to the hot milk and less foam left on top And cappuccinos down under always come with chocolate. Gog and Magog strike the time in Melbourne's Royal Arcade. Read the words on the sign underneath the photo. (Left side) These two 7-feet giants have been striking the time on Gaunt's clock since 1842. They were carved from clear pine and modelled on the figures erected in Guildhall, London, in 1708 to symbolise the conflict between the ancient Britons and the Trojan invaders. "(Right side) Mythology tells of the giants Gog and Magog (also known as Corineus and Gogmagog) having been captured in battle by the Trojans and made to serve as porters at the gateway of an ancient palace on a site later occupied by the Guildhall. It is traditional for Gog to stand to the north and Magog to the south. Melbourne is clean, clean, clean and flower-bedecked year 'round. Melbourne's Federation Square is downtown's main meeting place. Choose from 15 fooderies or tour the Racing Museum or very cool National Design Centre. Melbourne has a terrific art energy going on, and street performers are part of the scene. Lest you think they're just randomly unusually talented, know that city fathers require that street performers audition officially. Might be taking things too far, but the rule does make for true performances on corners and, certainly, at Federation Square, where someone's always doing something for the crowd. Federation Square's 7,865 sandstone tiles, which are laid on Kulin nation land, were quarried from Western Australia and make a gorgeous pattern from overhead. St. Kilda, a district of Melbourne, is a fine place for backpackers to meet, party and lay heads on many, many hostel pillows. Flinders Street Station, like nearby Federation Square, is one of downtown Melbourne'smain meeting spots. And a fine place to dance and direct traffic. Southbank is the area of Melbourne along the southern bank of the Yarra River. Cross Princes Bridge, turn left and walk down the steps to the river. Southbank is a formerly dilapidated area recently renovated and now a hub of theater happenings and trendy restaurants. Check out the Southgate Arts and Leisure Precinct, Melbourne's entertainment precinct, which is home to the Arts Centre and Hamer Hall (formerly Melbourne Concert Hall), and walk to the Southgate market at the eastern end of the riverbank walkway on Sunday mornings for a lot of homespun Australian goods. *The* place to have breakfast in Melbourne, Hardware Lane is one of many rejuvenated Melbourne laneways where you'll find fun shops, eclectic restaurants, and the hidden but cool-clubs-of-the-moment (you may have to guess, but here's a hint: look up. Literally.) Hardware Lane's converted warehouses are a good spot to find outdoor gear, too; Cafe Miro and Invita (vegetarian) may be interesting dining choices. Hardware Lane is between Queen Street and Elizabeth Street, near the Block and Royal Arcades. Queen Victoria market is a great place to idle away some hours any day of the week in downtown Melbourne, though Saturday morning is the peak time to see stuff and watch people. Think about taking the Victoria Market Foodie Tour to learn some history and munch some delectable samples in the Dairy Hall, fruit and veggie aisles (note the oldest tomato stand in Australia), and the Meat and Fish Hall. The Queen Victoria Market is about two blocks from Melbourne's Nomads Hostel, a good place to base yourself in Melbourne. I bought one of the cooler souvenirs of my life in the Queen Victoria market -- a didgeridoo made by Stan Yarramunua, Yorta Yorta man and wonderful artist. I shipped it home to the US via UPS (how would one carry a didgeridoo on a plane?) and thought I'd give it to my significant other as a Christmas gift surprise -- but it beat me home, and here's a clue regarding the surprise factor: UPS Australia ships didgeridoos in a didgeridoo-shaped box clearly and largely printed and labeled with, "UPS Didgeridoo Box." Do cruise down to Melbourne's Southbank on a Sunday morning and check out the homegrown Australia merchandise (often handmade) at the Southgate market. Queen Victoria Market is a must any day.